"...I consider being gay among the greatest gifts God has given me." 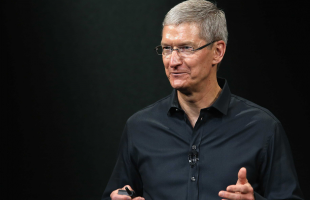 In an essay penned for Bloomberg Businessweek, Apple CEO Tim Cook openly talks about his sexual orientation, speaking at length about how being gay has shaped his tenure with the technology and fashion giant. This essay is also the first time Cook has publicly, and directly addressed his sexuality. "For years, I've been open with many people about my sexual orientation," said Cook in the editorial. "Plenty of colleagues at Apple know I'm gay, and it doesn't seem to make a difference in the way they treat me...While I have never denied my sexuality, I haven't publicly acknowledged it either, until now. So let me be clear: I'm proud to be gay, and I consider being gay among the greatest gifts God has given me." Cook then talks about how his sexuality impacts how he sees the diversity within Apple's consumer base, saying that being gay has given him a "deeper understanding of what it means to be in the minority and provided a window into the challenges that people in other minority groups deal with every day." As someone who covers Apple on a near-daily basis, this announcement is a "Late to the Party," kind of coming out; Cook's sexuality hasn't been up for debate among the tech-present for years, going at least as far back as 2009 -- Cook's COO, and interim CEO days when then-CEO Steve Jobs took a medical leave of absence. With his Apple history in mind, Cook's coming out in such a formal way, while unsurprising, is an important moment in the tech world, and in the business world in general. He's not the only openly gay executive at a Fortune 500 company, but he's certainly one of the most visible. Part of this essay is dedicated to shining a spotlight on workplace equality laws. Cook says Apple is in strong support of such a law currently before Congress, and the company has spoken out against discriminatory laws in states like Arizona. "I will personally continue to advocate for equality for all people until my toes point up," said Cook. And if Cook's moment inspires others to come out to their friends, families, and coworkers, I support him all the more.